Hey 40-year-olds, Busch Gardens Williamsburg is turning 40 this year too – and this opening weekend only, anyone born in 1975 can get in for FREE! Just bring your driver’s license to the park. Parking fee will still apply. Everyone else, remember to purchase your Busch Gardens Fun Cards by March 31 to get Water Country included for free, and register your preschooler for their free Preschool Pass! Busch Gardens Williamsburg and Water Country USA begin daily operations on May 23; Busch Gardens is currently open Friday through Sunday and Water Country will open May 17. 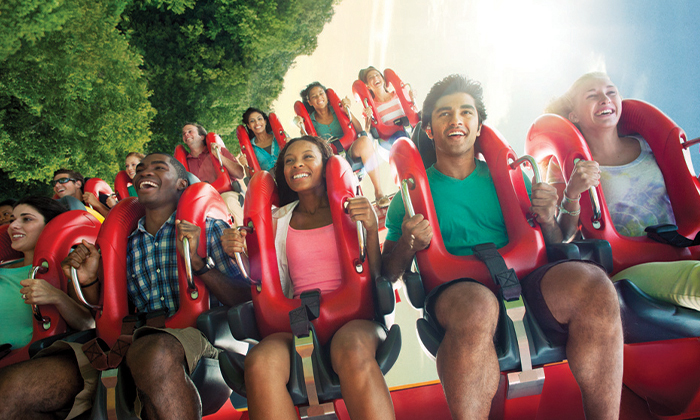 SAVE $14 when buying Busch Gardens tickets online with promo code BGWFOODLION. Valid for up to six tickets, through September 1, 2014. Discount is also valid for Water Country USA. Alternatively, guests may also bring their Food Lion MVP card to Busch Gardens Williamsburg or Water Country USA and receive $14 off a single-day ticket. Receive a FREE kids ticket when purchasing a full-price adult ticket – use promo code BGWPAMPERS. Valid for a child ages 3-9. The number of free child tickets must be equal to or less than the number of paid adult tickets. Ticket valid for one day only between March 16-September 1, 2014. Free Military Tickets – Waves of Honor permits any U.S. active duty military, activated or drilling reservist, or National Guardsman to one complimentary admission per year to either SeaWorld®, Busch Gardens®, Adventure Island®, Water Country USA®, or Sesame Place® or Aquatica SeaWorld’s Waterpark™ in San Diego for military personnel and as many as three direct dependents. For your service and sacrifice, we thank you. 2-Park Fun Card – For $97, get unlimited admission to Busch Gardens AND Water Country USA through Sept. 1 on regularly scheduled operating days. Expires May 18th, 2014. Valid for a single-day admission to Busch Gardens Williamsburg between March 16-May 18, 2014. Operating hours and days vary, please check schedule before arrival. Child ticket is valid for ages 3-9. Adult ticket is valid for ages 10 and up. Limit 10 per person. Limit 1 per visit. eTicket not redeemable with mobile app. Must provide first name, middle initial, and last name at checkout. Valid only for option purchased. Busch Gardens Williamsburg Fun Card 2014 – Includes Water Country USA! If you’re planning on purchasing a Busch Gardens Williamsburg Fun Card this year, *do it by March 31, 2014* – You’ll not only get unlimited visits to Busch Gardens through September 1, but also unlimited visits to Water Country USA! No promo code required. On April 1, the price for this 2-park pass increases to $97. Water Country Fun Card is $50 if purchased separately. Fun Cards do not include cost of parking. Busch Gardens opens on March 16; Water Country USA opens on May 17. Good news parents – the Busch Gardens Preschool Pass is back for 2014, offering free admission to both Busch Gardens Williamsburg and Water Country USA through September 1, 2014 for kids ages 3 through 5 (age 2 and under are free anyway). The passes must be redeemed at the park by May 31, 2014. You will need proof of age – either a birth certificate or passport. Questions? check out the Preschool Pass FAQ. WILLIAMSBURG (January 21, 2014) – It’s not too early to start planning a spring break vacation. And a visit to Busch Gardens® and Water Country USA® is more affordable than ever for parents with young children using a Free 2-Park Preschool Pass. Through this online-only offer children ages 3 to 5 can get a preschool pass this spring and enjoy unlimited admission to both Virginia parks through Sept. 1. Busch Gardens offers more than 50 KIDsiderate® attractions, including Sesame Street® Forest of Fun™ and Land of the Dragons®, which are celebrating big anniversaries this spring. Kid-sized roller coasters like Grover’s Alpine Express at Busch Gardens and Water Country USA’s Kritter Korral™ are among the can’t miss kid-friendly attractions waiting for families to enjoy this spring. Visit www.buschgardens.com/bgwpreschoolpass before May 31 to register for a Free 2-Park Preschool Pass. Proof of the child’s age is required at the time the passes are redeemed and the passes must be redeemed at either park by May 31, 2014. Children ages 2 and younger receive complimentary admission and do not need to register. Visit http://www.buschgardens.com/bgwpreschoolpass for complete details.